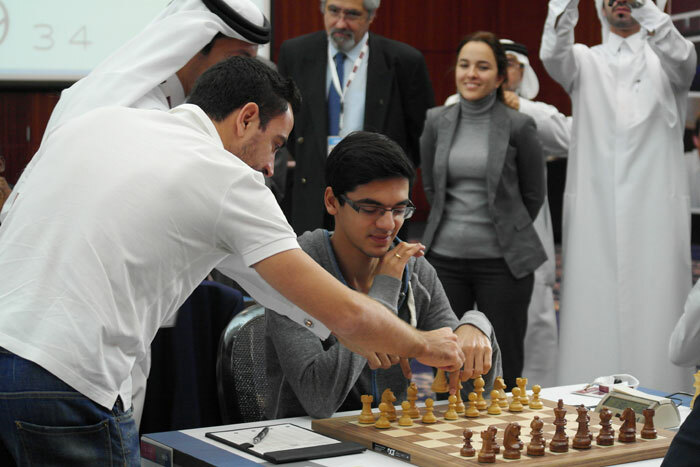 It was an extremely exciting and eventful year of chess and a lot has been said and written about it already, including this Best of 2015 article and Shipov’s Review. My ten points come in no particular order, seeing as I’ve mixed it all: players, teams, events and games. Last year, Magnus Carlsen achieved the incredible feat of collecting all three World Championship titles. In 2015 he lost his blitz title, but that didn’t stop him from winning no less than 5 classical supertournaments: Tata Steel Chess, Grenke Classic, Shamkir Chess, London Chess Classic and the Qatar Masters Open. Hikaru Nakamura: The American came close to Carlsen’s record, as he won four tournaments: Gibraltar, Zurich, the US Championship and the Millionaire Open. Besides that he also crossed 2800 for the first time in his career and qualified for the 2016 Candidates Tournament by virtue of finishing second in the FIDE Grand Prix. Sergey Karjakin: The former child prodigy won what was probably the most exciting World Cup ever after a thrilling final (where, out of 10 games, not a single one was drawn!) against Peter Svidler. In August, Sergey also single-handedly dispatched the entire Chinese team in a friendly China-Russia match. Pavel Eljanov: Another World Cup hero, Pavel eliminated the likes of Jakovenko, Grischuk and Nakamura, before being stopped by the eventual winner Karjakin in a dramatic semi-final match. In case you missed it, catch up with this interview with the likeable Ukrainian grandmaster. Anish Giri: The Dutch wunderkind is still to win his first major tournament, but in 2015 he achieved the exceptional feat of remaining unbeaten throughout the three legs of the Grand Chess Tour and scoring more combined points than anyone else. Anish will also start 2016 as the world number 3, with a rating of 2798.
Who is your pick for the 2015 player of the year? Who was the "player of the year" for 2015? 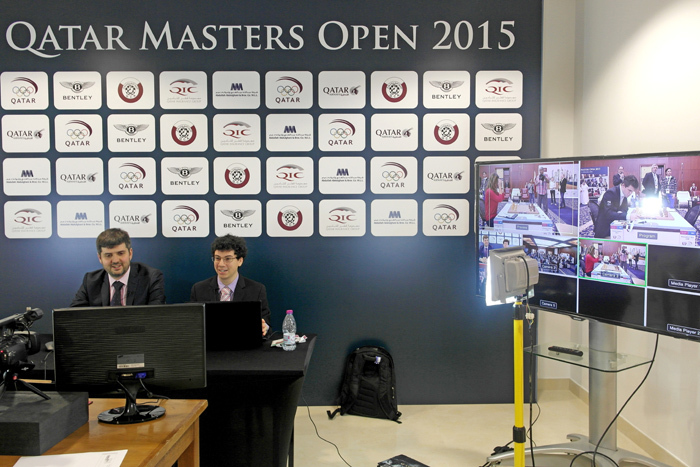 If you missed it, you should read Peter Svidler’s account of the Russian’s way to victory. As an aside, after retiring from professional chess the previous summer, Judit Polgar had her captain's debut in Iceland and led the Hungarian team to a bronze medal. After surprisingly winning the 2014 Olympiad in Tromso, the Chinese team confirmed their success by winning the 2015 World Team Chess Championship in Armenia. China was also fielding the youngest team of the event, with Ding Liren, Yu Yangyi, Bu Xiangzhi, Wei Yi and Wang Chen. It will be interesting to follow how the Chinese fare in the next Olympiad in Baku. 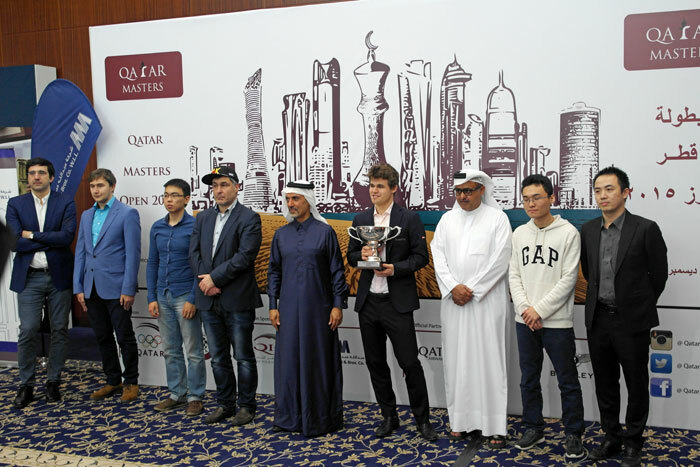 In my opinion there are three players who stood out in terms of slumps of form and impressive comebacks: Levon Aronian, Maxime Vachier-Lagrave and Vladimir Kramnik. In August 2015, Levon had fallen out of the world top ten for the first time since January 2009. A rating drop to 2765 left him in 11th place in the August 2015 rating list. In the very same list, the Frenchman also known as MVL had dropped to a shocking 24th place with a rating of 2731. 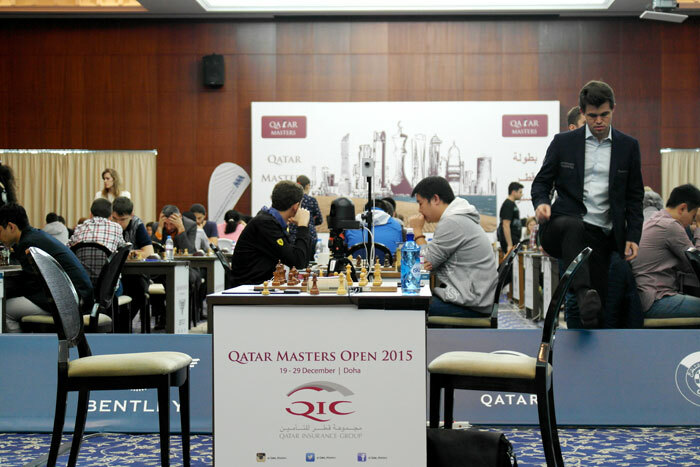 Meanwhile, former World Champion Kramnik had started 2015 in 8th position with a rating of 2783. However, as of 1 January 2016, all three players are back up where they belong, with Kramnik in 2nd at 2801 (the Russian is also the only player besides Carlsen to be rated above 2800), Aronian in 4th at 2792 and Vachier-Lagrave in 7th at 2785. This is Maxime’s highest ever position in the rating list, and I very much look forward to seeing how these three players will do in 2016. The playing conditions were perfect and Tournament Director Mohamed Al-Modiahki managed to invite football great Xavi (a World Cup winner and FC Barcelona legend) to make the opening move of round 3. The tournament was also the strongest ‘open’ (well, open to players above 2300 anyway) tournament ever, with the field of 132 players averaging a 2529 rating. More than half of the players were GMs and 17 out of these 71 were rated above 2700. For all the numbers and statistics, you can check out this summary video. A stunning final video was also released, including all tournament highlights. I had initially included the Gaioz Nigalidze cheating scandal in my list of worst moments, but after some reflection and listening to the advice of a couple of friends, I decided that catching a cheater red-handed for the first time ever probably had to go into the highlights after all. It is indeed the first time a cheater is caught in the act, judged by the FIDE Ethics Commission and punished accordingly. But let’s go back to the beginning: in the 6th round of the Dubai Open 2015, GM Gaioz Nigalidze — the reigning Georgian Champion — was caught using his phone, which he was hiding in the toilet, during his game against Tigran Petrosian. You can read all about the incident, as well as Vlad Tkachiev’s very interesting take on cheating matters on chess24. On 24 December 2015, the FIDE Ethics Commission announced Nigalidze would be banned for 3 years as well as being stripped of his GM title. Despite Hou Yifan having another solid year and leading the women’s rating list by a 90-point margin (following Judit Polgar’s retirement), the unofficial title of women's player of the year surely has to go to Mariya Muzychuk. 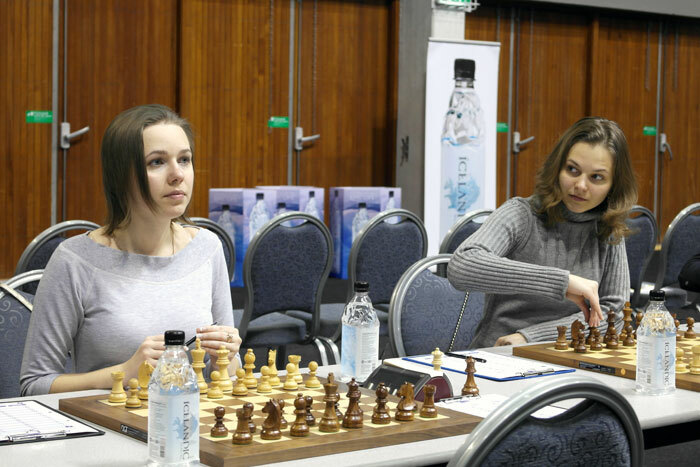 The younger of the two Muzychuk sisters had a very impressive showing at the World Cup in Sochi and was crowned World Champion after beating Natalia Pogonina in the final, aged only 22. 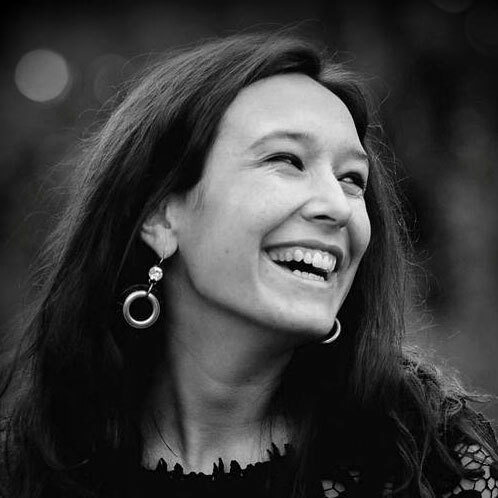 On the January 2016 women’s rating list she sits in 3rd position and is going to defend her title against none other than Hou Yifan in a match to be held in Lviv in March. 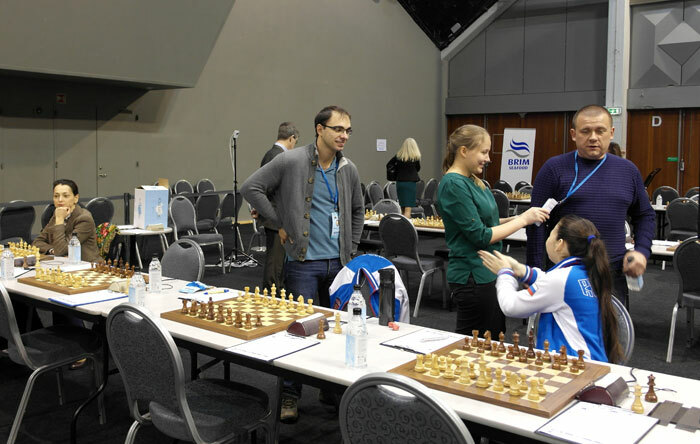 While Hou Yifan keeps very busy in the run-up to this event, one oddity of the year 2015 was the fact Mariya Muzychuk’s games from the Ukrainian Championship (which was held at the beginning of December) were kept secret. Khismatullin - Eljanov: Khismatullin’s 44.Kg1! was hailed by many as the move of the year and when Eljanov resigned, his own king was standing on h4. Navara - Wojtaszek: By move 30, Navara’s (white) king had made it all the way to h8! Wei Yi - Bruzon: A tactical gem - when Bruzon threw in the towel he was a rook up, but his king found itself under slightly too many threats on h3. That's it for my personal highlights of the year 2015! If you think I missed out on anything or if you would like to share your views on the topic, you can do all of that in the comments section below. Read the follow-up to this piece, with my 10 lowlights of the year.